Parlux (PARL) originates, markets and distributes "prestige" fragrances licensed from celebrities. The company pays royalties to Paris Hilton, Kanye West and other celebrities to sell perfumes headlined with these stars' names. While the company has been through some rocky times (its subsequently-departed president actually won the award of "Worst CEO" in 2006), the company appears to be back on track. Sales were up last quarter (year over year) in a very tough retail environment, and costs were lower. Sales are expected to be up this quarter as well, as the company has been hard at work bringing in new celebrity fragrances that augment and diversify its product portfolio. It's not clear that customers will embrace PARL's new products. But what is clear is that PARL is priced such that investors don't have to pay for these profits: the company trades for just $40 million, while it has net current assets of $100 million. The company does, however, have some risk factors to consider. For one thing, it is owed $10 million by a related retailer that has defaulted on some payments. Furthermore, its rather large inventory of GUESS products ($20 million+) may have to be destroyed if not sold in the next six months. The company has also maxed out its current loan agreements (at $6 million) and is trying to find a new source of debt financing. Finally, while there are just 20 million shares outstanding, there are warrants outstanding for another 5 million shares. Despite these risks, the market appears to have overpunished this stock. A reading of the notes to the financial statements reveals that 4 million of the outstanding warrants have a strike price of $5, meaning the current price would have to more than double before current shareholders are affected. Furthermore, even after writing off all moneys owed by Perfumania ($10 million) and all inventory related to GUESS ($20 million), the company still offers investors a generous margin of safety. While it's not neccessary that the company execute successfully on its new brands in order for the current shareholder to be rewarded, such success could serve to generate outstanding returns at the current stock price. 1) When a terrific investment opportunity is available, a bigger investment should be made. As Pabrai calls it: "Few bets, big bets, infrequent bets". 2) Participate in investment opportunities that have minimal downside risk but high upside potential: "Heads, I win; Tails, I don't lose much." Last week, the shareholders of Soapstone Networks (SOAP) elected to liquidate the company. It was determined that the shareholders of record on Friday, July 31st would receive the final dividend (if any) of the liquidation proceeds, which are expected to be doled out in the first quarter of 2010. On the company's last day of trading on the Nasdaq, SOAP traded for $7 million. Did this represent a value investment? On its last set of financial statements, SOAP showed $82 million of cash against $3 million of liabilities. But that was before the company paid out a special dividend of $3.75/share, which comes out to about $56 million. So that leaves the company with about $23 million. The latest statements are from March 31st, however, and the company burned about $7 million in the first quarter. Since there was no mention of liquidation in the quarterly report for Q1, it's probably safe to say the company burned some more cash in Q2. If we're conservative and assume the company burned the same amount in Q2 as it did in Q1, that brings our running total to about $16 million. From these numbers, it would appear as though investors could realize a 100% return in the course of a few months. However, in the interim, the company will also likely have to pay lawyers, consultants, bankers and other fees in order to complete its liquidation. It may also have to pay some amounts to settle some outstanding lawsuits. While these will likely subtract from the cash balance, the company will also have the opportunity to trade some of its property and equipment for cash. This is where someone who knows the value of the assets has an investing advantage. Will shareholders of record on July 31st make money on their purchase? Probably. But nevertheless, there's a risk involved. If the company's assets fall within the circle of competence of the investor, there may be a margin of safety to be had. Otherwise, it may be more of a speculation play than a value investment. Twin Disc (TWIN) manufactures and sells power transmission equipment (torque converters, propellers, clutches etc) to the marine industry. Due to the fixed-cost nature of such heavy manufacturing, one might expect this company to have dipped deeply into the red in its fiscal year ended June, 2009. Indeed, as recently as four weeks ago, the company traded for just $6.50 per share, after earning $2 per share in its 2008 fiscal year! In the last four weeks, however, the shares have almost doubled, after the company reported earnings per share of $1 for its fiscal year ended June, 2009. But all the signs were there that the company's profitability was more buoyant than its share price. Astute value investors enjoyed the dramatic gains in this company's stock. What has helped the company stay profitable through this downturn is its diversified customer base. While the mega yacht market may be taking a breather for a while, backlog for military customers has remained strong and in some cases increased from last year. As evidence of the company's financial viability, its earnings through the first three quarters of fiscal 2009 remained relatively solid. Through the first 9 months of the year, TWIN generated operating income of $14 million; yet its market cap hovered around $70 million just three weeks ago, despite the company's reasonable debt to total capital ratio of 37%. Despite the market's recent runup, for those looking for value, plenty of gems remain available. Lazare Kaplan (LKI) acquires, cuts, polishes and sells diamonds to wholesalers and retail jewellers. What makes this company an intriguing value play is the discount at which it sells to its liquid assets. Current assets are $225 million (including $125 million worth of diamonds) versus total liabilities of $169 million, for a difference of $56 million. Meanwhile, the company's market cap is just $19 million. While this may make the company look like a buy on the surface, the power of this company's supplier is a major risk to the future of this stock. De Beers controls most of the world's diamond supply, and exerts pressure on its customers (cutters like LKI) by only selling diamonds to companies called "sightholders", of which there are approximately 80 companies including LKI. The sightholder contract is only three years long, however, and so it is vital to these 80 companies that they stay in De Beers' good books. As such, their gross margins are low. Perhaps more importantly, however, "In order to maintain their purchasing relationship, [De Beers'] clients have traditionally been expected to purchase substantially all of the diamonds offered to them by the [De Beers]." During recessions, demand for some items tends to stay relatively stable. Diamonds do not fall in this category, however, as customers downgrade their selections, resulting in lower sales. In the latest quarter, LKI has seen its sales drop by almost 50% year-over-year. Usually, a company with a large inventory can stop making purchases and convert that inventory to cash, thus rewarding shareholders who purchased at a discount to the net current assets. If the excerpt from LKI's annual report in the previous paragraph is correct, however, LKI's actions may be governed by De Beers' best interests, not those of LKI's shareholders. Indeed, despite the major dropoff in sales, LKI's inventory last quarter remained flat, and is 15% above year-ago levels! While De Beers may in fact stop forcing inventory on its clients considering the drop in demand, banking on this may not be a risk worth taking. Furthermore, if De Beers decides that LKI no longer meets its short list of 80 companies, LKI will have a difficult time sourcing its supply of diamonds. While this stock may be cheap and will likely reward shareholders, there is a risk that things could go south, as De Beers, rather than management, controls the future viability of this business. Pabrai starts the book by discussing the term "dhandho" (pronounced "dhun-doe"), which is a Gujerati word meaning "endevours that create wealth" or "business". Gujerat is a coastal province in India that has served as a hotbed for trade with Asia and Africa. The Patels are a subsection of Gujeratis that are particularly entrepreunerial (they were chosen by the rulers to run the operations of the farm and collect the taxes), and their entrepreneurial ventures led to them forming a dominant part of the East African economy by the early 1970s. When Asians were thrown out of Uganda in 1972 on the basis of their race, a flurry of Patel immigrants landed in Canada, England and the United States. The Patels now make up about 0.2% of the American population. Yet they own over half of the motels in the entire country, which comprises $40 billion in assets and $725 million in annual taxes. Pabrai attributes this to particular conditions which led the Patels to recognize and benefit from the minimal downside risk and upside potential that existed in the motel business when they immigrated to the United States. Retail Ventures (RVI) is a holding company that owns 63% of another public company, DSW Inc (DSW). While RVI does have certain liabilities (related to its divestitures of other businesses) and its own corporate costs, its ownership in DSW is now the dominant determinant of RVI's value as a company. Buying RVI stock, however, is not guaranteed to return 100% even if these stocks converge over the next few years. This is due to the fact that it's entirely possible the market is overvaluing DSW and that it's price will eventually come down. Like the housing industry, the auto industry is currently in the midst of a cyclical downturn. In a cyclical downturn, a drop in demand (caused by a drop in consumer confidence, for example) leads to bloated inventories, which results in output cuts (plant closures, job losses etc.) as auto manufacturers try to reduce inventories. These output cuts then affect the revenues of all auto parts manufacturers. 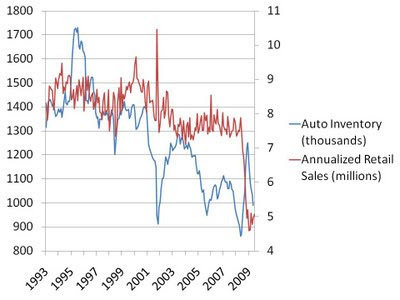 By tracking auto inventories, we can get a feel for how much longer these depressed revenue levels at auto parts manufacturers will persist. 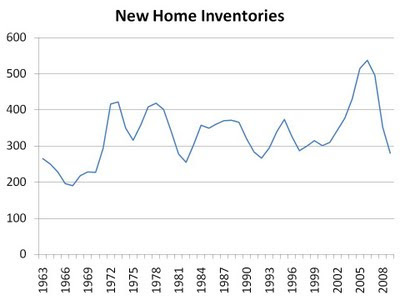 When demand is abnormally higher (or lower) than expected, inventories become depleted (or bloated) as a result. Auto manufacturers adjust output, bringing inventory levels back in line. 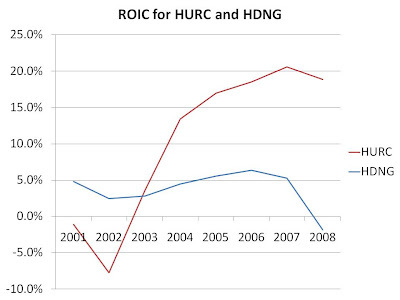 Clearly, a major adjustment took place in late 2008 and early 2009. Sales seemingly fell off a cliff. As a result, the country was left with a pile of inventory. As retail sales stabilized, however, manufacturers cut output so drastically that even though retail sales remained low, inventories nevertheless fell quickly! But inventories cannot fall forever. Auto makers will soon have to increase production such that inventory levels stop free falling. When they do, auto parts manufacturers will see their revenues rise. They won't rise to 2007 levels until retail sales show signs of returning to those levels, but they will not stay at their 2009H1 levels either, barring another shock to consumer confidence that causes retail sales to drop even further. During this process, companies with fixed costs (e.g. 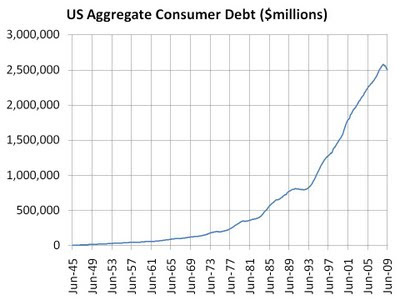 debt/pensions/leases) that cannot be met will go bankrupt. Value investors are looking for the companies with the staying power (i.e. the cost structures and low debt levels) that will allow them to pick up this dropped market share and thus benefit disproportionately when output stabilizes. Investors looking to understand a company's current financial position (i.e. the company's debt levels, its cash balance, what it owns and what it owes) will often flock to the financial statements contained in the company's most recent quarterly report. After all, quarterly financial statements are required to be fairly comprehensive, and therefore contain most of the information an investor needs in order to determine a company's current financial position. However, subsequent events that have occured since the cut-off date of the last financial statements can dramatically alter the value of the company in question. As such, it is important that investors not stop at the statements; subsequent disclosures need to be taken into account. Consider Fortunet (FNET), creator of gaming platforms and networks for casinos and other customers. Fortunet trades for just $13 million, but is profitable, has no debt, and shows a cash balance of $25 million. This cash balance, however, is as of the latest financial statements. An investor buying in using this information would get a rude awakening in the company's future statements: since the cut-off date for the last financials, the company has issued a special dividend of $28 million! Existing shareholders have already received this payment. Shareholders buying in now, however, are buying into a company that's $28 million poorer. To avoid falling prey to such a situation, there are two items investors should check. First, even though the quarterly financial statements have a cutoff date, the text of the quarterly report will contain a section labelled "subsequent events" that contains material information that occurred just after the cutoff date. Secondly, investors should read the company's subsequent disclosures since the quarterly report was issued so that they can include any material changes that have occurred since the quarterly report was issued. Humans enjoy mental exercises, puzzles and games. Munger attributes this to the fact that humans have a natural love for accurate cognition. As such, one of the best ways to convince a man to do something is to explain the reasons for why it must be done. As an example of this tendency put to great use, Munger describes the philosophy of Carl Braun, the skilled designer of oil refineries. Whenever an order was given within his company, the order must always be accompanied by the reason why. Braun would fire those who didn't give the 'why', because he understood the positive influence it would carry down the line. Because of this human preference for reason, even meaningless or incorrect reasons will increase compliance. Munger references a psychology experiment where people budge to the front of the line with meaningless excuses that are better received than they should be! Marketers and various corporate departments will of course use this loophole within this reason-respecting tendency by offering up various claptrap reasons to help them get what they otherwise would not. As such, the student would be wise to investigate/analyze reasons before accepting them as valid.